Meet Shuma James Nakazawa. 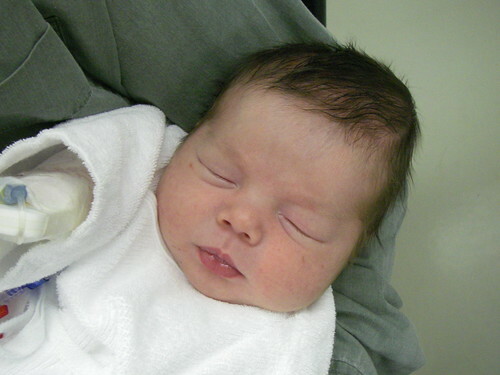 He was born September 20th, weighing 3854 grams and measuring 50 centimetres- a big, healthy boy. He had a little trouble breathing though and had to be taken to hospital, where he was kept for a week. We were sad to be apart but he got lots of love and care from the nurses and doctors, and long daily visits from his mom and dad. And yesterday, on his one week birthday, he came home! See more pictures of Shuma in his photo album. Wow!!! Congratulations to the whole family! What a handsome little guy! Best of luck to the three of you on your new adventure. Omedetou! Congratulations! What a handsome handsome little boy. Oh and when you have a moment, can you let us know the kanji for Shuma or perhaps the meaning? Congratulations! Glad he's doing better. He's just beautiful! congratulations!! i love his name, too! Congratulations! What a cute little smile! Congratulations! I'm so happy he's home now and doing well. He is just beautiful. 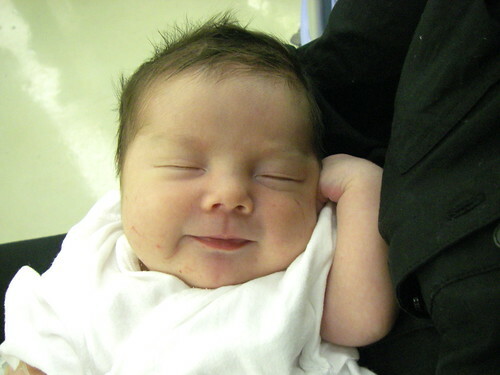 He looks like Dad when he asleep, but has his Mom's smile. Congrats Amy!! He is gorgeous, we are so proud of you!!! I hope you are doing well. saw the album on flickr...so cute! congratulations again! Congratulations!! He is absolutely adorable. Congratulations and best wishes. He is beautiful! How lovely! best wishes to you, what a cute little fella! Congratulations!!! Your little Shuma James looks so serene in those photos. How beautiful he is. I wish you three all the best! What a divine glimmer of a smile he has going! Gorgeous! Omedetou gozaimashita blue lotus! Will he be spending Xmas in Canada and see the great white north for the first time? Congratulations! May you all have a wonderful, happy experience with your new baby! Ometedou gozaimasu! He looks so cute! And that's a strong name. Awesome. You look good too post-giving birth. Congratulations! What a beautiful baby! I've been a long time reader of your blog, and have taken even more interest the past 6 months (I just started my 3rd trimester). Thanks for allowing me to share in your pregnancy and birth. Omedetou! How fantastic. I'm so thrilled for you and your husband; he is a gorgeous baby. Do keep us posted on his development! I'm also a long term reader of your blog and I've also started reading it more intensesly ever since you've announced your pregnancy. We are parents of one girl (23 months old). It is an amazing journey. Take lots of photos and videos, because that first year goes by so fast. And enjoy him when he's just a wee infant, because that goes by even faster. No wonder no posts - congratulations! おめでとう!!!!!!!!!! He is so adorable and very lucky to have you two as parents:). Congratulations! He's so precious. He has your smile in the first picture! Welcome, little Shuma! We are all so glad to meet you! How is your Mom feeling? Are you letting your parents get any rest? Let us see your smile again soon! Congratulations!! Shuma is such a lovely baby and the cutest one I've ever seen! Congratulations Amy and Hideaki!!! :) He is so adorable... what a beautiful boy. Congratulations to you- Shuma is so beautiful! A lovely Tiger year boy! Best wishes to the three of you. Thank you for sharing these wonderful moments with us. Congratulations & my best wishes! Toutes mes felicitations aux parents de l'adorable Shuma.Il est à croquer. Well done all of you! He is so cute and what a great photo at the top of your post. As I am typing this my little girl (16 weeks) is "talking" to me and rolling around on the lounge floor. You are in for a great treat over the next few weeks (and years! ), you won't believe how quickly he will change. Have lots of fun, congratulations! Now I can look forward to posts on what it's like to raise kids in Japan! What a wonderful gift you have been given! Congratulations! Congratulations! I've been casually following your blog for a couple of years. I can relate well to your experiences with pregnancy in Japan, since I live here too. Congratulations again and best wishes! Congratulations! What an adorable boy. I just want to kiss those cheeks and toes. So happy to hear he is doing well. Je suis tombée par hasard sur votre blog il y a peu et je l'apprécie beaucoup! Toutes mes félicitations aux heureux parents et tous mes voeux de bonheur et santé pour cet adorable petit Shuma. Il est adorable sur la première photo avec son petit sourire! He's so cute! I'm glad he's feeling better. Post pics (and tell us how the labor went) as soon as you're all settled in and able. Congratulations!! What an adorable baby. You will be wonderful parents! This brought back fond memories for me when I gave birth to my daughter in Japan. Just want to add my congratulations to the list. I'm so happy for you all. Hope he turns out to be a "foodie" like his mum! Congratulations - he is lucky to have two very open, loving, and adventurous parents! Oh, and he's pretty adorable, too.